The SCAV magazines are new collectibles in DLC Nuka World for Fallout 4. A total of five editions of the magazine can be found in the amusement park and any collected magazine provides you with a new passive Perk. In this guide with video, we will show you the locations of all SCAV Magazine and how to unlock the perks. The Terrible Truce: Increases the chance of success with speech challenges. Fear The Knife King: Increases the damage of battle and folding knives by 25%. Mutant Fists of Stephie Knuckles: Unarmed melee damage is increased by 10%. Nuka Brahmin Stampede: Increases damage caused by explosives and grenades by 5%. 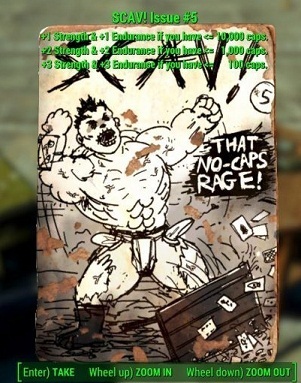 That no-Caps Rage: +1 to strength and endurance, if you have fewer than 10,000 bottle caps. +2 On strength and endurance, if you have fewer than 1,000 bottle caps. +3 To strength and endurance, if you have fewer than 100 bottle caps. Once you have found all the magazines in the various theme parks of Nuka World, you’ll get the achievement or the trophy Diebrarian.